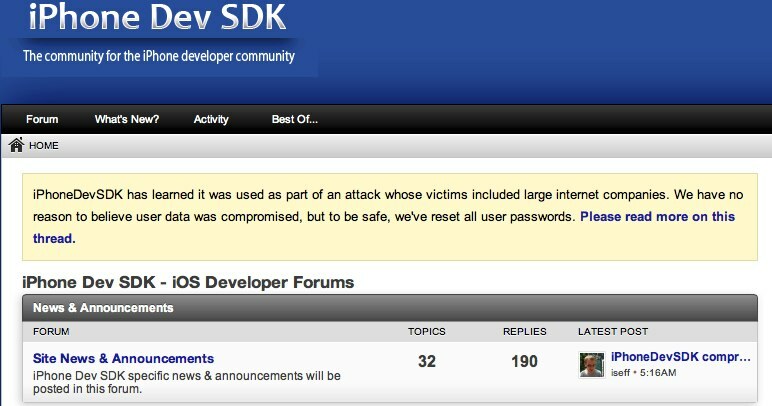 In January, a number of Apple employees had their Macs compromised following visits to the popular iPhoneDevSDK forum. Employees from Facebook and likely dozens of other companies were compromised as well. In a blog post today, site owner Ian Sefferman shared some limited details* about what happened and what the site is doing about it. Most notably, the attack was reportedly ended by the hacker on January 30, 2013, meaning the site believes that there is no ongoing threat. We’re still trying to determine the exploit’s exact timeline and details, but it appears as though it was ended (by the hacker) on January 30, 2013. As with Facebook, it’s important to stress that we have no reason to believe user data was compromised. Eric Romang has done some additional detective work on the the attack, laying much of the blame on Java itself. Last month, Apple twice blocked Java 7 from working on users’ Macs, perhaps after the company discovered that its own machines had been compromised. You are currently reading iPhoneDevSDK Details What Led to Apple, Facebook Hacking at chicagogeek.